Apple has plenty of reasons for users to stay within its ecosystem, especially in the world of iOS. FaceTime and iMessage have long been two of the biggest, and while Apple did once promise to share its working out and make portions of the duo open-source, it never quite happened. The lack of iMessage has often been pointed to as reasons people simply cannot contemplate making the jump from iPhone to Android phones, for example, and Apple clearly knows that. There have been hacks to try and get iMessage working on Android phones before, with limited success. A new app works surprisingly well, though, at least for now. There are, of course, plenty of competing instant messaging platforms that do things as well as iMessage. Facebook Messenger, WhatsApp and Telegram are some, but there are so many more. Still, iMessage has a huge pull thanks to its native and seamless inclusion in all iOS and macOS devices, making it difficult to pull away from. 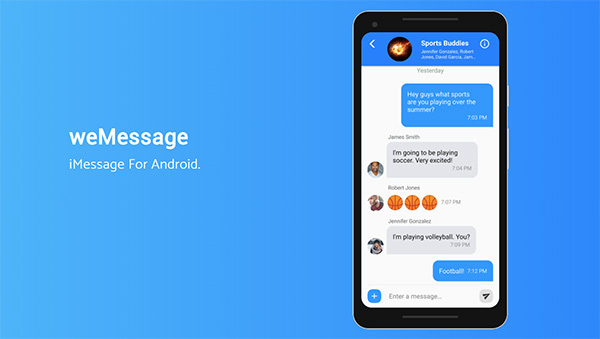 weMessage for Android brings iMessage to the competition, and it actually works. As if iMessage on Android couldn’t get any cooler, the fact that it is an app and server-side combination created by a 16 year-old boy just blows our mind. Take a bow, Roman Scott. He posted to Reddit to share his work and, as well it should, it got plenty of attention. My name is Roman, and I am a 16 year-old app developer. I have recently published my first app to the Play Store, called weMessage. 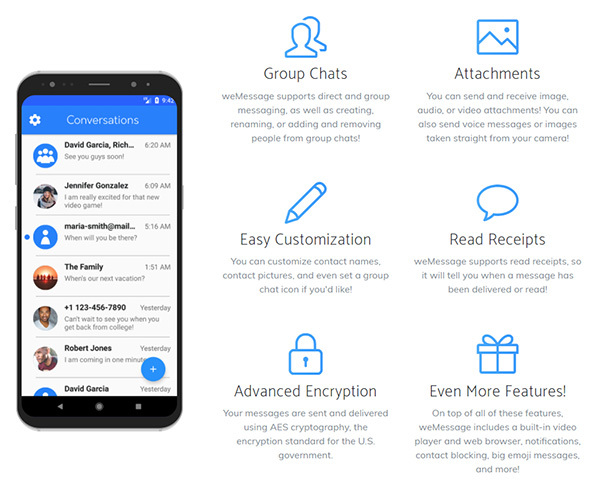 weMessage is an app that allows you to use iMessage on your Android phones or tablets. I created weMessage due to the inability of people on Android to use iMessage’s ecosystem. Although it is allows you to use iMessage on your Android device, I cannot close the gap between Android and Apple completely because weMessage is reliant on an Apple computer, which I will explain below. weMessage is composed of two pieces of software: the Android app itself and a messaging server that I called the weServer. In order to use weMessage, you need to install the weServer on a Mac computer. The weServer acts as a “bridge” between the Mac computer and your Android device. The weServer is a messaging server that processes and relays iMessages to and from the Android device. The reason why an Apple computer is needed is because the iMessages need to be sent through an Apple device in order to be delivered. The iMessages need to be sent through Apple’s servers, and the only way to do this legitimately is to use an Apple device. If the weServer supported Windows or Linux, I would not only be violating several EULAs but would be relying on an exploitation that would likely be fixed in the future. Of course, the idea of using a Mac app to serve iMessage messages to an Android device has been done before and, as is to be expected, Apple has found ways to prevent those methods soon enough. So far, Scott’s method works just fine but we would try not to get too used to it. We certainly wouldn’t want to base a switch from iOS to Android on it, that’s for sure! You can download weMessage right now over at wemessageapp.com. If you own a Mac, you’re 99% likely to have an iPhone. Um… no you ‘re not…. want to provide some evidence for that ridiculous statement? Last survey I saw done showed about 60% of Mac users owned an iPhone…. Like the article said, don’t get too used to it. Apple will find a way to shut it down soon. Darn… it’s just a proxy. Needs a web based front end so it could be used on any device. If that happened I’d be willing to run a dedicated VM for OSX just to handle this. Exactly. The family of my close friend has about 3 Macs and my friend uses also a Macbook but never used or own an iPhone. 99% is clearly an exaggeration. However, it’s not far off. Blackberry and Windows Phone are dead. The only remaining smartphones are iOS and Android. If you’re someone who is a fan of Apple design and own a mac/macbook, you have literally 0 reason to get an android. And you’ve already shown that you’re willing to pay a premium for Apple’s designs. So you’d have no problem buying an iPhone. p.s. the last survey you looked up was from 4 years ago and is worthless.